The teres major and minor muscles are tiny back muscles when compared with your latissimus dorsi -- and even smaller than your deltoids. These muscles originate on your shoulder blades then insert into your arm bones, or the humerus. The primary role of your teres minor muscle is to rotate your upper arm outward as if to catch a ball in your hand. 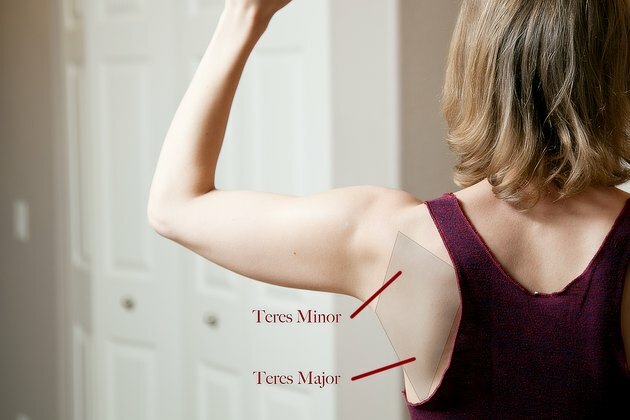 The teres major helps draw your arm back toward the middle of your body and extend your upper arm behind you; it also helps rotate your humerus inward. 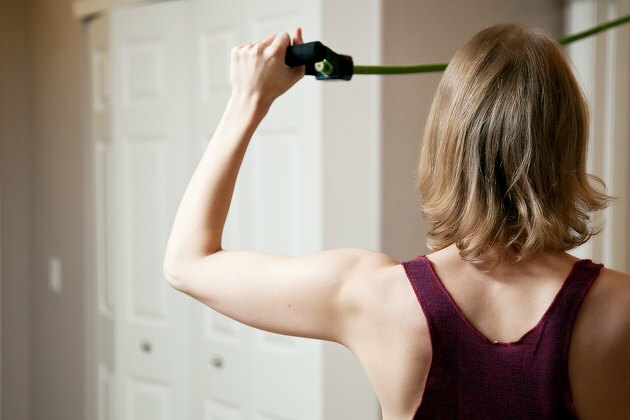 Loop an exercise band with a handle on each end through an immovable bar at shoulder level. Insert one handle through the other then pull, securing the band around the bar. 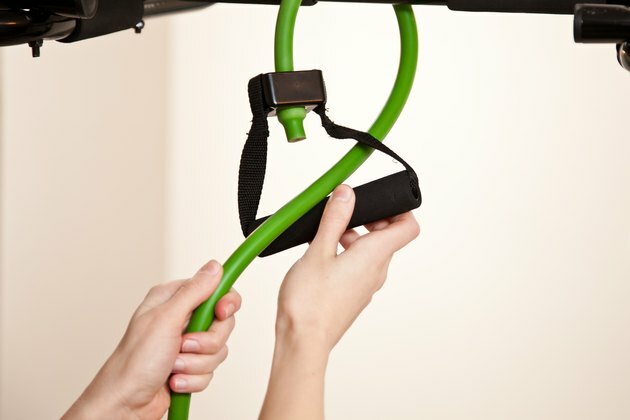 Hold one handle in your right hand and step backward from the attachment site until a slight tension is in the band. Raise your right upper arm out to your side, bending your elbow so your shoulder and elbow form 90 degrees; your forearm should be parallel to the floor, with your palm facing down. Keep your shoulder and elbow joints at a fixed 90 degrees as you raise your forearm until it is perpendicular to the floor, engaging your teres minor muscle to rotate your upper arm outward. Lower your forearm back toward the front until it is parallel to the floor and repeat for one set of 10 to 15 repetitions. Switch arms to work the teres minor on the other side of your body. Continue to alternate arms to complete three sets, stepping backward just a little bit if you need to increase the resistance. 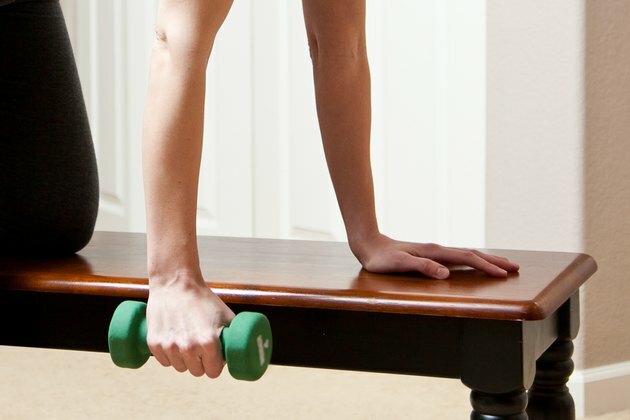 Hold a dumbbell in your right hand, then place your left knee and your left palm on a flat exercise bench. Your knee should be under your left hip, and your palm should be under your left shoulder. Draw your navel toward your spine and stick your buttocks out behind you to maintain a flat back throughout the exercise. Contract your latissimus dorsi and your teres major muscles to pull the dumbbell toward you, extending your upper arm behind your rib cage as you squeeze your right shoulder blade toward your spine. Hold the contraction for two seconds, then slowly lower the dumbbell until your arm is straight. Repeat for one set of 10 to 15 repetitions, then switch arms to work the teres major on the left side of your body. Continue to alternate arms for three sets, increasing the weight or the number of repetitions you do with every set. Use a barbell to do two-arm rows in place of one-arm dumbbell rows every other workout, further strengthening your teres major. If you feel as if you have a shoulder injury, check with a doctor before you exercise your teres muscles. Anatomy and Physiology; Gary Thibodeau et al.